I am going to try to be better at recapping my Instagram outfits on here – I have not done it in over a month so I will try to do it monthly from now on.. Just a heads up though, if you ever has issues with Like To Know It, you can scroll to the bottom of my blog and click the image and get the exact details without having to sign up. The Nikes run small – size up half a size. My handbag is cinched in on the sides making it look like a PM. The link on my LTK did not work for this picture so I wanted to have it up the top of this post. This sweater is. a. dream. It is so soft and is longer in the back. You’ll want this in a couple of colors! Photo Details: See full blog post w/all outfit details HERE. Photo Details: A shot from Halloween – my outfit was from Party City. Photo Details: Happy Camper Sweatshirt | PJ Pants (love these too) | UGG HouseShoes | Fitz PJs are from FabDog – he wears their biggest size though. *These sweatshirts come w/different sayings or phrases – they are SO soft and perfect for PJs, travel, or just being cute and comfy. I think mine is a M or L bc I wanted to to be pretty oversized. Photo Details: Full outfits here. Photo Details: ^ Same blog post. *These black leggings are the best. I have multiple pair and LOVE them. LOVE all of these outfits! That H&M cableknit is TOO adorable! I have the same chunky sweater obsession as you. I just love each and everyone in this post!! You always have the best round ups! Its giving me all the fall feels! Love your Halloween costumes and the pink sneakers! I love your rose gold Nike shoes! They are such a pretty color! All of your sweaters look so cozy!! Love the fall looks. Such an awesome insta recap! You have the most lovely outfits! Total fall inspiration! I love your Instagram recaps! I need the plaid tunic and the suede moto jacket. I finally ordered the jacket for myself after seeing it so many times! Oh and your hair gives me MAJOR hair envy! It always looks flawless. I love your Instagram posts! Those rose gold Nikes are absolutely stunning! You seriously have the best style!! I'm buying those gold Nikes as we speak- so amazing!! You are so cute Emily! I love your style and would wear every single outfit you put together. I always look forward to your blog posts! I look forward to every single outfit you post! You have the best style! Entered the giveaway and would love to add a new pair of Hunter's to my closet. I ???? your blog! Such amazing inspiration! I love all the boots!!! Fall/winter is my fav time of year! I love your roundups! 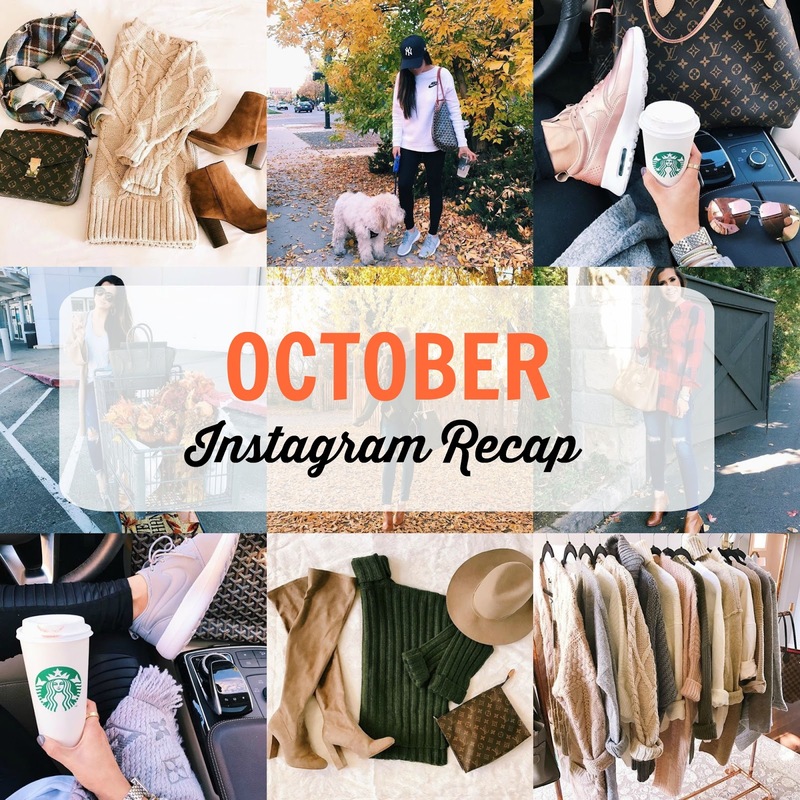 So many great fall items! What a wonderful roundup! I love the outfits and how you styled them. Very inspiring! Love your style, Emily! Always so inspired by the outfits you put together. How do I enter? I love your insta/blog and FB! I'm crossing my fingers that "Kristen" that won is me! ahh! how do we know which "Kristen" won?